While within 10 minutes reach of midtown Manhattan, Astoria, Queens maintains a quaint, small town charm and is often credited as being one of the most diverse zip codes in the world. You’ll find some of the best ethnic food in the city here in Astoria’s many cafes, bars and restaurants, largely due to the mix of Greek, Balkan, Brazilian, Colombian, Ecuadorian, Nepalese, Tibetan, Moroccan, Egyptian, Lebanese, and Irish (among other) populations that have settled here over the years. The city’s oldest (Czech) beer garden is also located here. Astoria is home to Kaufman-Astoria Studios, one of the first motion picture studios in the U.S.A. 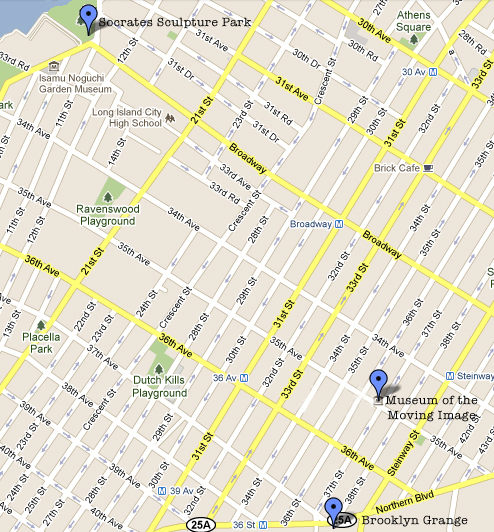 The first two Marx Brothers movies were made here, and Sesame Street has always been filmed at Kaufman-Astoria. Many successful film and TV productions continue to use the facility – located right next door to Museum of the Moving Image, where you will see the Rural Route Film Festival! Astoria was named after John Jacob Astor, then the wealthiest man in the U.S.A. Although he never set foot in the neighborhood, Astor could see Astoria from his summer home at what is now York and 87th St. Around the same time (mid-19th Century), Astoria became home to world-famous Steinway Pianos, as the German Steinway family settled a section of the area (then Steinway Village), which later became part of Astoria. We aim to continue to make the RRFF more and more of a community/neighborhood -affiliated event, and we feel that no matter if you’re coming from Brooklyn, Upstate NY, or Senegal, Astoria makes an awesome weekend getaway & place to hang-out while taking in Rural Route events! With new, lower-cost motels sprouting in the Astoria/Long Island City vicinity and plenty of sublease rooms available via craigslist, we recommend staying here & making a full weekend of it all!